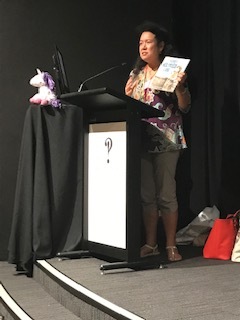 As if participating in the One Day SCBWI Sydney Conference was not enough, I was fortunate to be included in the auxiliary conference aimed specifically for proficient teachers with the objective of providing them with a unique educational experience with some of Australia’s finest children’s book creators - Creating Creative Writers PD Conference. The SCBWI presenters lineup read like a who’s who of Australian Kid Lit industry’s royalty and those sessions I sat in on were rich oceans of informative, insider tips and tricks designed to enlighten teachers and librarians and equip them with better, engaging, real-life methods with which to teach the art of story telling to children. The day, opened by Susanne Gervay, was primly organised into four separate sessions, each focusing on a particular area of creativity. the use of online visual resources to inspire and the importance of the editing process. Sandy’s use of Minecraft to stir imagination and develop story plots is not only contemporary but buckets of fun. Tim Harris encouraged us to ‘live mark’, to cease being the passive observer when it comes to promoting creativity in kids. He reminded educators to never overwhelm children when trying to get them to fix things, to simply aim at one thing to improve their writing at a time. The notion of ‘colouring in your story using language’ really appeals to this author, also. If they can make trouble, they can write it because writing a good story is all about making trouble! Sue Whiting then led experts in the area of creative nonfiction, Stephanie Owen Reeder, Gina Newton, Claire Saxby and Corinne Fenton through discussions on the challenges of researching and writing engaging informative texts.The panel explored the notion of how “creative” one can be when writing nonfiction or informative texts, i.e. where creativity comes into the process? And also how students can make facts/research their own, the importance of using multiple sources, and the use of “perspective” and “borrowed voice”. Panelists provided teachers with ideas for research techniques and activities designed to motivate teachers and students alike and enable teachers to facilitate quality student research and guide students through the process of creating fascinating and original informative texts. Discussing the trials and tribulations of trying to enthuse kids to read, write and enjoy poetry was tackled by Jodie Wells-Slowgrove and her panel of passionate children’s poets: Sally Murphy, Libby Hathorn, Meredith Costain and Lesley Gibbes. The panel debated whether poetry should be analysed, discussed the importance of reading poetry aloud and how explored how to encourage students to dig deep and write poetry with emotional truth. Sharing their vast experience with writing, performing and work-shopping poetry with students, the poets provided teachers with a myriad of practical ideas for infecting students with the poetry bug and for the development of specific skills, such as using rhythm, alliteration, simile, cadence, metaphor and word play. Poetry presenter dynamo and author, Alexa Moses read from the poetry anthology, A Boat of Stars. Any session on illustration always intrigues me as a picture book author. James Foley and his panel of four award-winning illustrators, Sarah Davis, Liz Anelli and Marjorie Crosby-Fairall, discussed the process of children’s book illustration, focusing on visual literacy and the construction of visual narratives. The panelists discussed their differing processes, tied by a common language – but rather than using words and sentences, their language uses the visual elements of colour, line, shape, body language, facial expression, typography, light and shadow, scale, and composition and in the case of Liz, stamps made from random objects! Attendees learnt first hand how creativity can be expressed and how tone and mood can be altered simply by changing the thickness of a line. 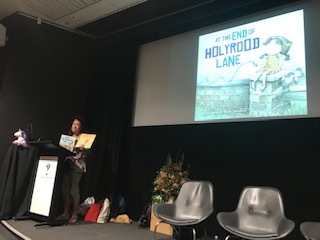 Sue Whiting followed this revealing session with a reading from her latest picture book, Beware the Deep Dark Forest, then yours truly wound up the day with a reading of At The End of Holyrood Lane, each book depicting the various nuances of illustration and symbolism referred to earlier. It truly was a packed day filled with praise from over 100 attendees for its smooth facilitation and phenomenal content not to mention the value and relevance of the stimulating readings.